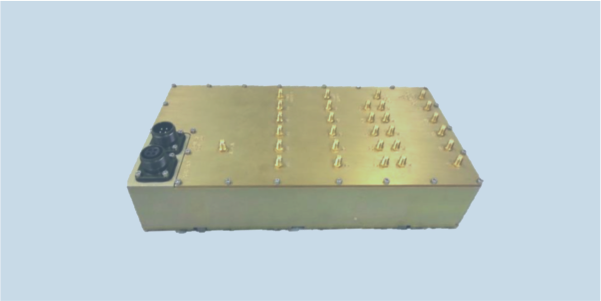 It accepts four frequency bands, each with five antenna elements, and outputs the elements of each band to the corresponding five RF outputs. The switch is controlled via an EIA-485 (RS-485) serial interface to allow remote control over a distance of up to 500 m.
The DF-A0064 includes an internal noise source as well as an external input for chain calibration purposes. The internal noise source or the external calibration input may be selected to simultaneously inject a balanced signal in place of the antenna inputs and thereby correct errors caused by variations in the system’s RF path. All inputs of the DF-A0064 are equipped with limiters to allow it operate in harsh EMC environments.